Huron and Perth County property and business owners are going to have opportunity to hear a dynamic young voice give a presentation on Magna Carta! Dr. Carolyn Harris, a history professor from the University of Toronto, is speaking at the Huron-Perth Landowner’s Association’s (H.P.L.A.) monthly meeting at the Brodhagen Community Center, Thursday, November 16. The doors open at 7:00 P.M.
Dr. Harris, a recognized writer and authority on Royal history, is sharing her passion for the “Great Charter” and how, although it was signed 800 years ago, still forms the basis of our Canadian Charter of rights and freedoms. The H.P.L.A. hopes that through such educational events, the public will learn how to deal with the increasing red tape and regulations that stifle development and free enterprise. The Administrative Penalties are back! Bill 68, Modernizing Ontario's Municipal Act, is in its second reading. And even though Ontarians have stated they do not want administrative penalties, its in the Bill. This amendment to the Municipal Act states you don't have to be charged, with an offence, yet the fine is put onto your property taxes for non-compliance of a by-law. So what if a by-law is passed that white trim isn't allowed? You don't get a day in court! The sections are below...isn't it time to tell this government enough is enough. And why haven't we heard anything about this from the Opposition Parties – where are they??? 434.1 (1) Without limiting sections 9, 10 and 11, a municipality may require a person, subject to such conditions as the municipality considers appropriate, to pay an administrative penalty if the municipality is satisfied that the person has failed to comply with a by-law of the municipality passed under this Act. (2) The purpose of a system of administrative penalties established by a municipality under this section shall be to assist the municipality in promoting compliance with its by-laws. (b) shall not exceed the amount reasonably required to promote compliance with a by-law of the municipality. (4) If a person is required by a municipality to pay an administrative penalty under subsection (1) in respect of a contravention, the person shall not be charged with an offence in respect of the same contravention. (b) imposing conditions and limitations on a municipality’s powers with respect to administrative penalties. 434.2 (1) An administrative penalty imposed by a municipality on a person under section 434.1 constitutes a debt of the person to the municipality. (2) If an administrative penalty imposed under section 434.1 is not paid within 15 days after the day that it becomes due and payable, the treasurer of a local municipality may, and upon the request of its upper-tier municipality, if any, shall, add the administrative penalty to the tax roll for any property in the local municipality for which all of the owners are responsible for paying the administrative penalty, and collect it in the same manner as municipal taxes. The Ontario Building Code, when combined with the Building Code Act and the Ontario Regulation 332/12, is over 750 pages. I image few people have read it in its entirety except our OLA Director of Research, Elizabeth Marshall. Fewer still, I imagine, have waded through the proposed changes to the Code (there are 700 of them). 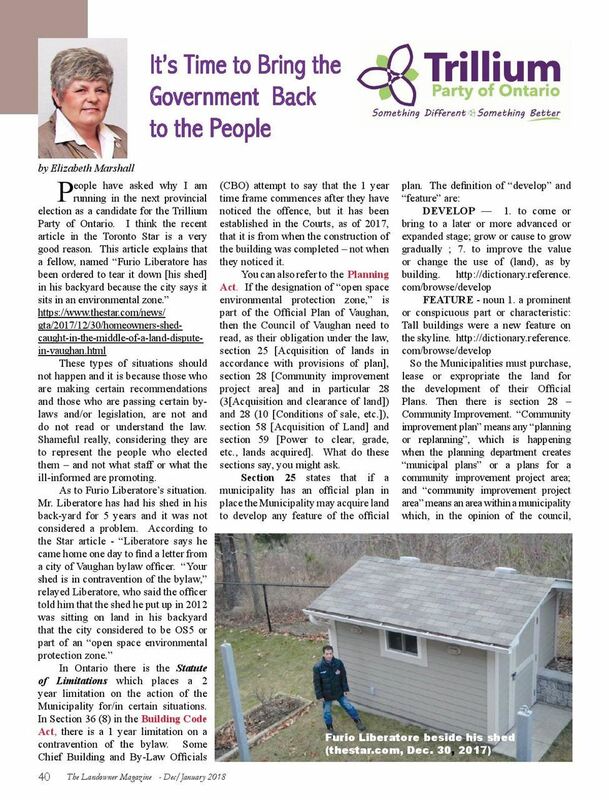 Unfortunately, buried deep in the bowels (pun intended) of the proposed changes is a mandatory requirement to have septic systems on private property cleaned out every five years. Yet, the public has not been invited to comment on the proposed changes. You can read the proposed changes here http://www.mah.gov.on.ca/AssetFactory.aspx?did=15603. Essentially, the change will require property owners with septic systems to have their septic tanks pumped every five years whether needed or not. In addition, the homeowner will be required to maintain records of all cleaning of their systems for submission to the chief building official upon request. These requirements should raise several concerns with homeowners. First and foremost, they infringe on property rights for no good reason. Rural homeowners understand the need for regular maintenance of their septic systems and are in the best position to judge when this might be necessary. When a system needs to be maintained is dependent on the capacity of the tank and the number of people using the system. The need to clean it out might be three years, five years, or even ten or fifteen. Technology in septic systems is advancing. Newer systems are designed to be as efficient and effective as possible and will only improve in future. Putting a five-year limit on septic system maintenance does not consider such advancements and unfairly targets those who invest in new systems. The requirement to produce documentation on your septic system maintenance to the chief building official is curious and leads to many questions. Your septic system is approved when it is installed, but we know of no authority which would support the notion that a maintenance record should be produced or even maintained for anything other than the homeowner’s purposes. Is this intended to give the perception that a municipality or conservation authority has yet another supposed avenue to enter onto your property? Phase One of the consultation on the potential changes to Ontario’s Building Code ended on December 20, 2016. http://www.mah.gov.on.ca/Page14996.aspx Those comments are now being reviewed by a committee. The person that I spoke to at the Ministry of Municipal Affairs, Building and Development Branch indicated that the code is meant for industry and that only industry was invited to comment. Hey, what about the people that are most affected – the homeowner? If you are emailing your comments, you may also want to copy the Building and Development Branch at the Ministry at codeinfo@ontario.ca. This Branch is responsible for development of the code. Today I would like to bring you some exciting news regarding Property Rights in this province. 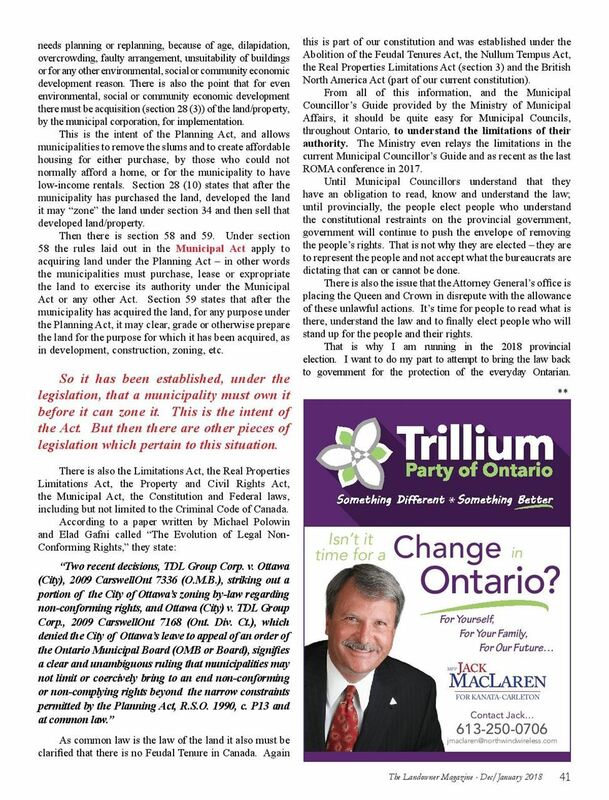 In the fall of 2015, the leader of the Ontario Progressive Conservative Party, MPP Patrick Brown asked MPP Jack MacLaren to form a Blue Ribbon Panel on Property Rights (BRPPR). A group of individuals with knowledge and interest in property rights headed up the panel. They have been working since that time and are now ready to get input from the leadership of various stakeholder groups, property owners and concerned citizens on the value of, and issues surrounding, Property Rights in Ontario. The consultation process will begin in March 2017, with a schedule for the meetings now being drafted. There is a website set up, www.YourPropertyRights.ca where the meeting times and places will be available. If you belong to the Ontario Landowners Association, please inform your members, your neighbours and family and friends about these meetings and urge anyone interested, to get out and have some input into this process. These meetings are open to all members of the public and we encourage anyone with an opinion to come out and help this Blue Ribbon Panel on Property Rights glean a wide cross-section of constructive advice that can then be included in the PC Policy platform at the Convention. The policy convention dates are November 25-26, 2017 at the Toronto Congress Centre, 650 Dixon Road, Etobicoke. For more information http://www.ontariopc.com/Events?smonth=11&syear=2017. The first day of the Constitution Challenge brought by Shawn and Trish was heard in Goderich Superior Court on October 26th. Shawn and Trish Drennan are presenting themselves in this action against K2 Wind Energy and the Ministry of Environment and Climate Change, represented by Emily Bala, Ministry of the Attorney General. The Court Room was filled with standing room only with concerned community members from all over Ontario including members from several OLA chapters. Their attendance demonstrated a great concern for the Health, Environment, and Property Rights of Residents associated with living in proximity to large Industrial Wind Projects. Superior Court is supposed to be a public hearing; however, in this case many of the people in the room could not hear the judge and the lawyers. There are several motions to be dealt with before going to trial. Legal representative for K2, Christopher Bredt (Borden , Ladner, Gervais), presented their desire to deal with this case quickly and proposed dealing with the motions to dismiss the action first. However the presiding judge, Judge R. Raikes, stated it would be more appropriate that the motions regarding the claims by Shawn and Trish Drennan be clarified and dealt with first. This case has been remanded to January 19, 2017. 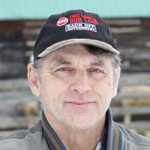 Tom Black, President of the Ontario Landowners Association (OLA), remarked that he always wonders if the AGM for the current year will live up to the ones in years past. 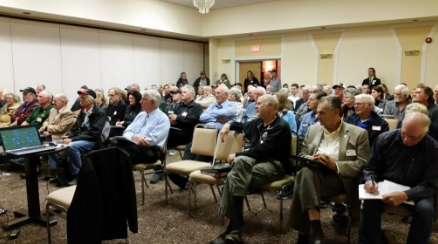 Held at the Admiral Inn in Lindsay on October 22, over 40 people attended the AGM and over 100 people sat in on the public meeting in the afternoon, so yes, we matched or bettered previous meetings. The attraction of course for many people is that we get to hear great speakers like Elizabeth Marshall (our Director of Research), Len Harris (former Senator from Queensland, Australia), Jeff Bogaerts, and Tom Black who all encourage us to know our rights and to stand up for our individual freedoms. And the best part is being in a room with a hundred or so other landowners, all with stories to share on how they are fighting back to preserve our private property rights. 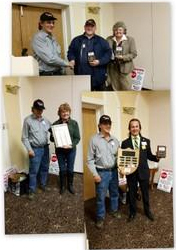 The 2016-2017 OLA Executive was announced by Tom Black, who returns as President with Jeff Bogaerts as Vice-President and governors, Donna Burns, Bob Weirmeir, Karl Von Bloedau, Duaine McKinley, and Stefanos Karatopis. Tom thanked Mark Tijssen, who stepped down as governor, for his contributions as governor over the past year. The OLA is in good hands. Stefanos Karatopis won Landowner of the Year for his property rights work in the Niagara Region. He has achieved many successful outcomes, including for his parents in 2009. A tireless worker for property rights, he is also studying to become a paralegal. Donna Burns accepted the award for Best Landowner Group of the Year on behalf of the Renfrew-Nippissing-Pembroke Landowners Association of which she is President. 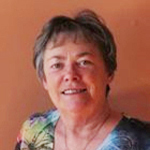 Donna and her group were key in educating the residents of Renfrew County about the implications of the county’s latest Official Plan. Without their work, many would not have been aware of the effects of the OP on their property values and right to use their land. About 70 people stayed for the dinner catered by Konstantine’s Restaurant. The good conversation continued into the night with a great exchange of ideas for better protecting our property rights. This information was sent to us by Elizabeth Marshall. See MPP Jack MacLaren's response to the Bill here https://www.youtube.com/watch?v=0cHObJTynGg. authorities that may interest the OLA. We hope all of you had a joyous holiday and are preparing for a busy 2016.